In 2018, I invested money in at least, 5 short-term instruments. And of all of them, by all matrices that matter to me, PayVest by Paylater which I only discovered a few weeks to the end of the year is the best of them all. Now, let me support my opinion with some details. I made an investment with a tenor of 6 months at 14.5% per annum. When you remove the policy-mandated withholding tax of 10%, you end up with a net return of 13.05%. Which is still better than 90% of the discount rates I got on treasury bills all year long. Before 2018, I'd gotten quite comfortable with keeping my money in treasury bills because the rates throughout 2017 were decent - between 16% and 18% for a really long period. However, in 2018, the rates took a dip to between 10 and 13%, which quickly got me looking out for alternative investment opportunities with better return rates and similarly low-risk. The best return rate from a similar solution to PayVest that I'd found earlier in the year was 10% per annum so you can appreciate why I'm excited about finding PayVest. 4.5% can be a lot depending on how much we're talking about. 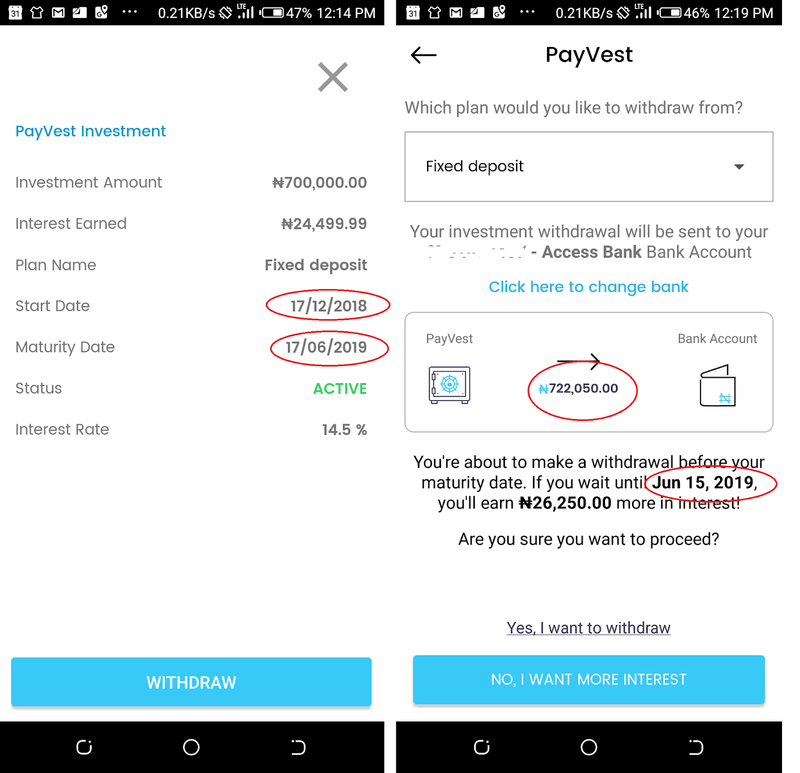 My biggest surprise after securing my fixed deposit with PayVest via the Paylater mobile app was that I could actually undo the transaction anytime I wanted without talking to anyone. On top of that, withdrawing prematurely does not come with any of the penalties you would get with similar short-term investment vehicles. I think that was such an impressive design choice because that degree of freedom just makes me want to leave my money in PayVest for even longer. You know, the fact that I don't have to overthink before I make an investment, knowing that if I found a better investment opportunity tomorrow, I could easily pull out my money is something that really works for me. It just means that I'll never leave any significant amount of money in my Nigerian savings account again knowing that I could earn 4 times as much returns on my capital if I moved it to PayVest for any of the available tenors. I have just one prayer for the PayVest product team though. Perhaps if I was more knowledgeable in finance, it would be obvious to me how my recommendation is outrightly bad for business. But in my state of ignorance, I would like to recommend that the tenors be modified to allow customers invest their money in increments of one month. One month, two months, three months... up to 12 months. I can't see why this wouldn't be a win-win for both parties. Repayments for Paylater loans which these investments are used to fund are on a monthly basis anyway. Also, it would be a first of its kind. I don't know of any short-term, low-risk investment vehicle in Nigeria apart from a bank account that gives you interest on a monthly basis. The minimum tenor is usually 90 days. To be able to earn withdrawable interest that is even as low as 8% per annum every month would surely attract more individual investors who can't tie down their money for as long as 90 days. I didn't have to add a card to the Paylater app to invest. As soon as I entered the deposit amount that I wanted to invest and confirmed the investment details, an account at One Finance bank was opened in my name - automatically. Next, the app showed me the account number and instructed me to make a transfer/deposit to that account. 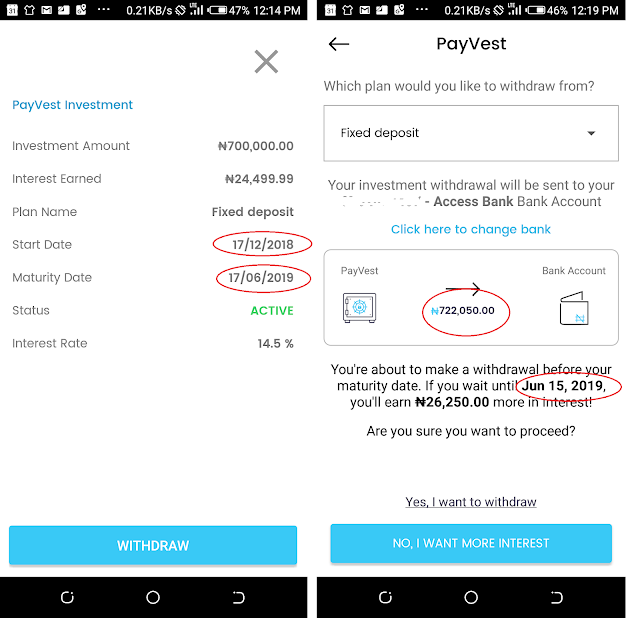 Once I did a transfer from my Access Bank internet banking, my fixed deposit was automatically booked on PayVest. It wasn't even 30 seconds after I completed the transfer that I received an app notification + SMS from Paylater, congratulating me for taking one step closer to achieving my financial goals. A few days after my first investment, I noticed that the app shows you the amount of interest you've earned so far. This value grows by a small amount each day. 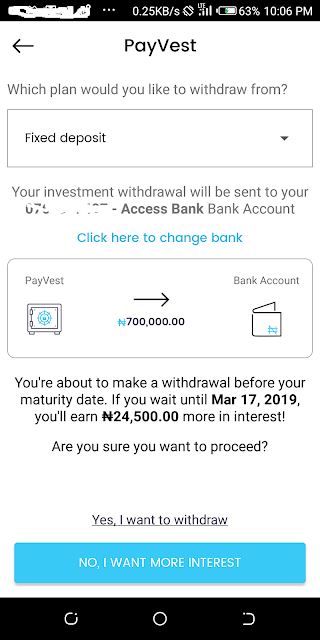 Naturally, I wanted to know whether or not I would get my accumulated interest if I withdrew my investment any day before maturity. Three days after creating the investment, I requested to withdraw it. Much to my disappointment, the money I got in my bank account was just my capital and nothing else. Three months into the subsequent 6-month investment I booked, I repeated the experiment. This time, to my absolute surprise, I noticed that if I withdrew, I would be credited with the same amount I'd have gotten if I'd originally booked a 3-month investment with the same capital. Again, out of curiosity, I wanted to know what would happen if I disobeyed a clear rule on the app. 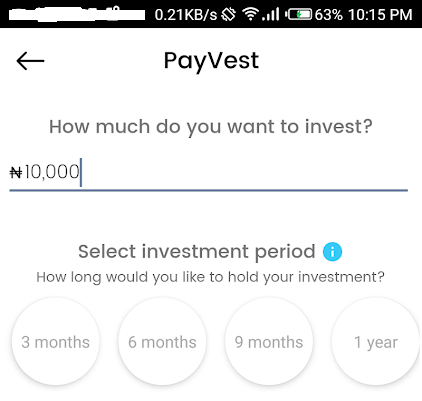 The instruction when you are about to make a Payvest investment says to deposit the exact investment amount to the account opened for you in One Finance bank. On this particular day, I was meant to invest 500,000 Naira. I felt like the system should be able to accept multiple transfers to make up the investment amount, as long as they were all done within the same day. Hence, I transferred 250,000 Naira to the stipulated account through my Access Bank internet banking profile. The transfer failed! But my account was debited and the funds were not reversed instantly. 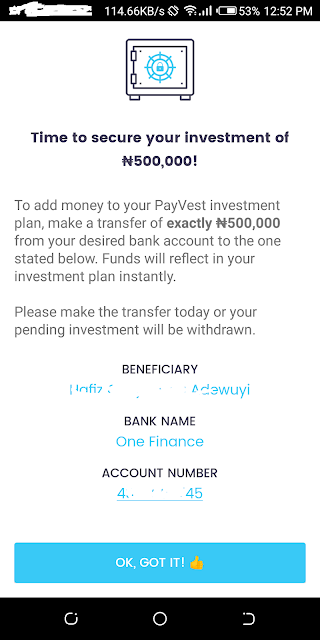 On the PayVest app, there was also no indication that I'd sent any fraction of the money. I got slightly worried because it was someone else's money, but not so worried as to be panicked because I knew for sure that this money was far from being lost; just hung up in limbo for a day or two at worst. I was dealing with two renowned organizations who are also CBN regulated after all. I placed a call to Paylater customer service to confirm if by any chance they had received the 50% of the investment amount that I sent. Within four minutes of being on the line, they had put any of the fears I had to rest. 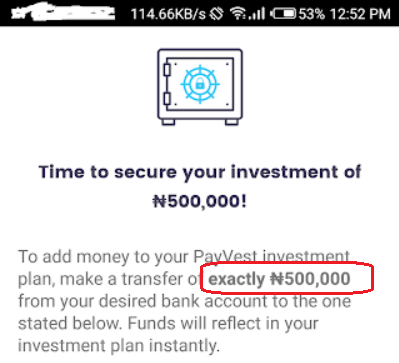 According to the customer service agent, there is a rule on the automatic One Finance bank investment account which ensures that any deposit to the account which is not exactly the investment amount you specified on PayVest will fail. He was sure that although the money had left my account, the money had not left my bank and that the money ideally should already have been reversed. And true to his word, the full amount was refunded to my account a little over 24 hours after I tried to send it. The reason why the funds could not have been reversed instantly is a discussion for another day.